November 27, 2018 – While we’ve enjoyed quite a mild/dry November here in the Pacific Northwest, today’s weather is definitely an indication that winter is just around the corner! We’re serious proponents of soaking during this time of year. It’s terrific to get yourself warmed up before bed with a hot tub soak, and it will help immensely to help you get a restful night’s sleep. We do realize, however, that some folks do use their tubs less during the colder/wetter months. 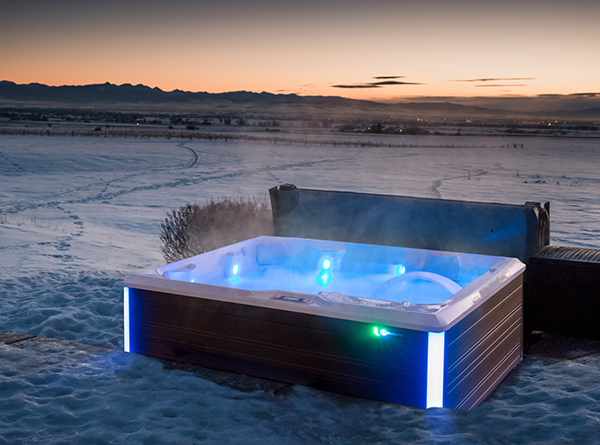 If you’re one of those, we offer up these suggestions on how to make sure your hot tub is not feeling neglected and ready for your soaks when you do open the hot tub cover and hop in! Clean the filters regularly. The idea that not using the tub means filters are fine is a no-no. Remember that your filters are still working to keep the water clean and ready for use. The sleeves of the filters will ultimately get clogged and need cleaning. At the very least do this once a month. And—be sure you’re using products designed to clean filters! Don’t lower the temperature. Energy consumption increases when you lower and raise the temperature over and over on the same body of water. Always best to leave the temperature at a consistent setting. That also makes it easier for you to take advantage of a spontaneous soak. Keep things balanced and sanitized. Just as mentioned before with the filters, a tub not being used still needs sanitizer occasionally added and the pH and alkalinity levels checked and adjusted. (The good news for SilkBalance users: If you add SilkBalance weekly your water should stay balanced and you can avoid weekly testing!) Sanitizer does dissipate, so make sure you’re adding it at the very least every couple of weeks when not in use. Check your ozone system. Ozone is a terrific thing to help keep water fresh and oxidize contaminants. BUT—realize that an ozone system only lasts so long, and it should eventually be replaced. 2-3 years is a good amount of life for an ozone system. Check the ozone system’s production with a test kit and replace if no longer working. And—check your tub’s owner’s manual for info on how to clean your ozone system if it’s still otherwise functioning properly. Check your hot tub cover. Your hot tub cover can be your friend and keep your tub hot and energy efficient—if you do your part. Be sure to clean the cover regularly with dishwashing liquid. If you get tree sap on the vinyl, lighter fluid will often remove it. Clean the underside with baking soda or Simple Green and a Scotchbrite Sponge. Condition the exterior vinyl with 303 Protectant. It will provide UV protection and help water to bead up and roll off the cover instead of getting absorbed into the cores and increasing water-logging. If the tub requires service? If by chance the tub stops working, best to leave it full of water. If it’s not heating, keep the tub circulating so the water is on the move vs. stagnant in the plumbing and equipment. You can help keep components in the equipment warm by putting a shop light in the equipment bay of the tub. That will generate a bit of extra heat to guard against freezing if the temps at night are dropping below 32 degrees Fahrenheit. Again, our hope is you keep soaking through these fall and winter evenings—health & wellness has no season! But, should you leave your friendly hot tub alone for extended periods during this season, these tips will do much to keep things on the right track.